Mix & match what you have to get the style you want. This probably sounds obvious to you but I am design challenged and need help! 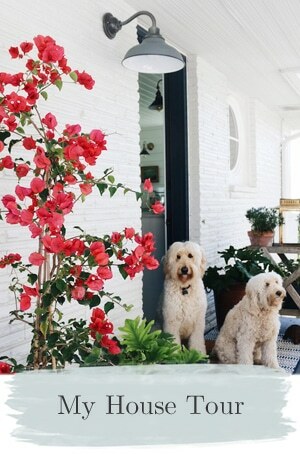 I want to lighten up my more traditional style to get more of an eclectic cottage vibe. I know everyone says they want to lighten things up. But the problem is I need to use what I have, which is pretty basic traditional style furniture and even several dark wood pieces. I don’t want all cheap new furniture, because I do like the quality of what I have. Some of what I have could be painted, but some of it I just like as it is and don’t want to deal with painting. And I cannot afford to start over! So I really need inspiration on how to incorporate traditional wood furniture or antiques into a lighter fresher cottage space. Is that even possible or is it going to look too dark and dreary? Can you help? Thank you so much for your email, Andrea! I have received quite a few emails on this same topic so I hope I can help answer your question with three tips for mixing and matching what you have to get the style you want! 1. Embrace what you already have or love. Most of us have to work around furniture we already have, which is not necessarily a bad thing! 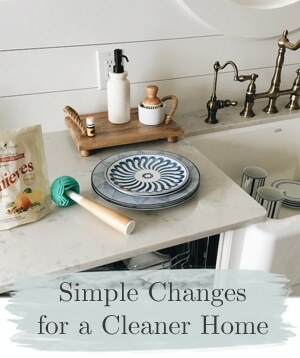 But if your furniture is dark or traditional and you want a lighter more cottage-y look, are there ways to lighten up your style without painting everything or tossing your furniture to the curb? YES INDEED! If you have some great quality classic pieces, I say KEEP, USE, and ENJOY them! For instance, you can freshen a traditional or dark solid wood bed with pretty linens, throw rugs and a modern mirror above the bed and select updated colors for your room. The trick to embracing traditional furnishings in a lighter cottage space is to mix things up in the room to lighten the mood, rather than getting rid of the furniture or even assuming it all needs to be painted. 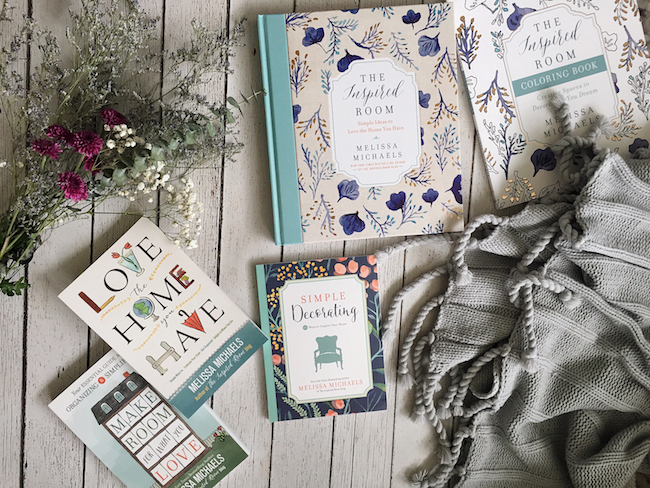 There are plenty of ways to lighten a room even using what you already have or love! If you have a traditional bedroom set with nightstands and matching dresser, perhaps put the nightstands in another bedroom to mix up the set. Or paint the nightstands or the dresser in a fun color to lighten the overall mood, and you can keep the bed as it is! You’ll save yourself money and effort and your room will be fantastic. I love this dining room. 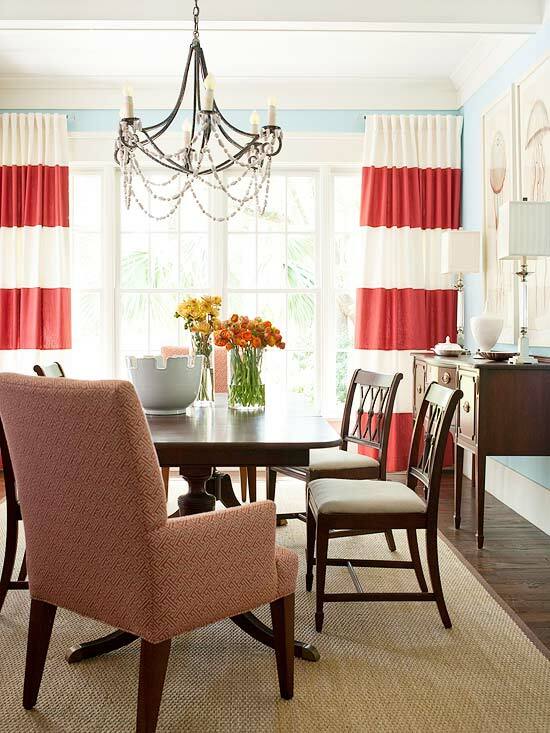 It has traditional dark wood furniture but the blue walls and awesome red striped curtains make it clear this is a fresh and updated space for a modern family. You might even find that you love your traditional pieces even more than you thought you did once you embrace how really interesting the mix and match style can be! Here is an example of incorporating a couple of dark wood pieces and a traditional sofa into a fun quirky youthful and modern cottage. By mixing in a modern rug, some trendy lamps, and a fun blend of stripes and patterns, this space is anything but traditional, dark, boring or old fashioned. >>>A room with a mix like this is easy to update and evolve over time and will always look fresh and inviting. You don’t have to throw everything out to get a fun new look, just mix and match old and new. 2. Stretch your own creativity. Often times we equate “lighten up our style” with doing away with the old and bringing in new lighter or more trendy pieces. 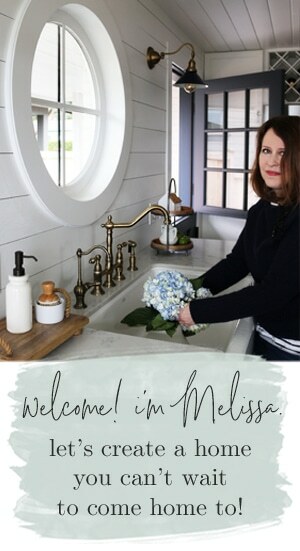 I actually think incorporating what you already have and embracing a mixture of styles, including wood furniture and painted traditional pieces and a variety of colors, textures and patterns, is often a braver and more interesting design choice because it requires you to stretch your creativity (and your budget!) in new ways. >>>Don’t be afraid to be creative and try a mix of furniture styles you haven’t seen before. In fact, please DO try a mix you haven’t seen before! 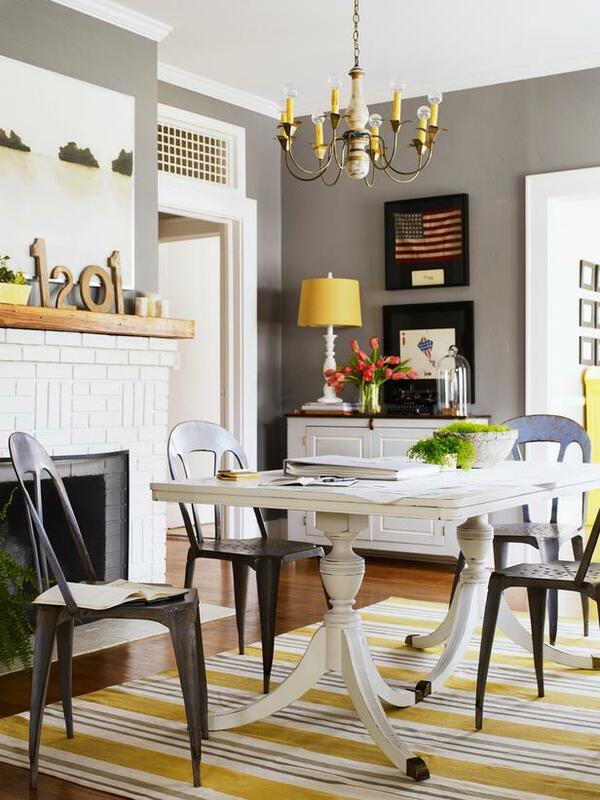 Above you can see a fun mix with a painted antique table paired with funky old metal chairs, a bold cottage style striped rug and deep modern gray walls. By reserving the bold modern pattern for the rug and making brave color choices like dark gray walls and deep yellow touches throughout the space, this room is crisp, youthful and fun. I think the mix and contrast of beautiful wood in a space can make a room so interesting! 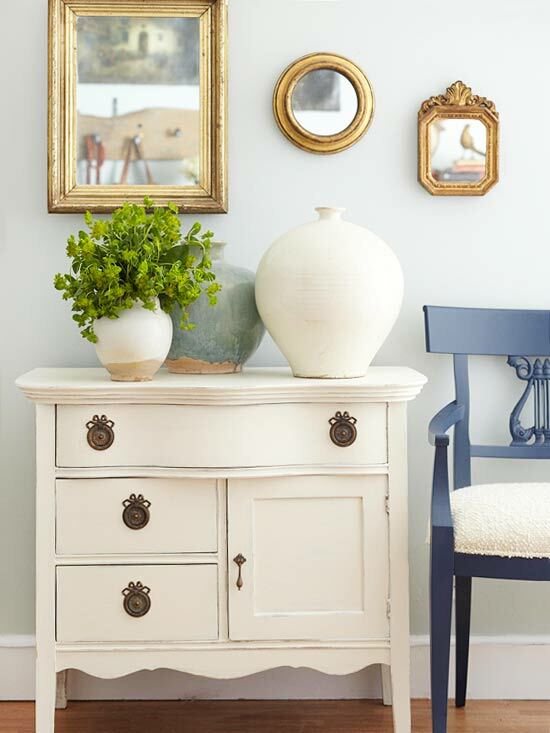 And solid wood furniture and antiques are far better built and much more charming than the cheap mdf stuff you can buy right now, so incorporating a variety of good quality pieces definitely will bring a long lasting character to a home. In this bedroom, above, you have very solid dark wood pieces. 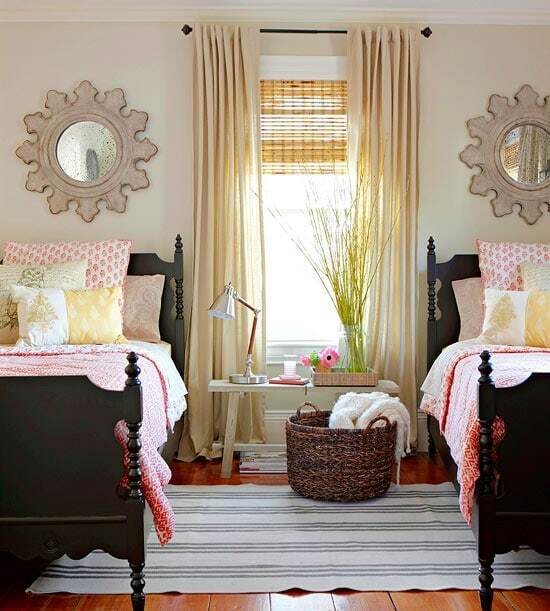 The fun starburst style mirror, a fresh wall and ceiling color and cheery skirt on the nightstand make the room light and fun, but still grounded by the awesome bed. >>>Make the bold choice to use what you have and mix things up a bit more to create a fresher style that is uniquely yours! Here is another example of a brave mix featuring a traditional wood table. This table and the matching chairs are pretty and great quality. See the gorgeous wood grain? Why cover that up when you can use it to enhance your room with the additional beauty of a quality antique piece? In order to freshen up the room and give it a more relaxed and modern appeal, the seats were covered with a fun graphic fabric and the table was paired with a built in white banquette to mix up the seating. In contrast, a backdrop of clean white walls look fantastic with the modern light fixture. To relax the space even more, the ceiling was covered with a rustic wood. >>>A contrasting mix of elements make a room more interesting and unique. Here is another brave mix that incorporates a variety of pieces and finishes. An antique dark wood dresser, a dark spindle leg bench covered with animal print, a traditional white nightstand, dark gray walls, a nail head headboard, a modern lamp and bedding in bright colors and a traditional rug. >>>You can create a look that is 100% unique when you use what you have! 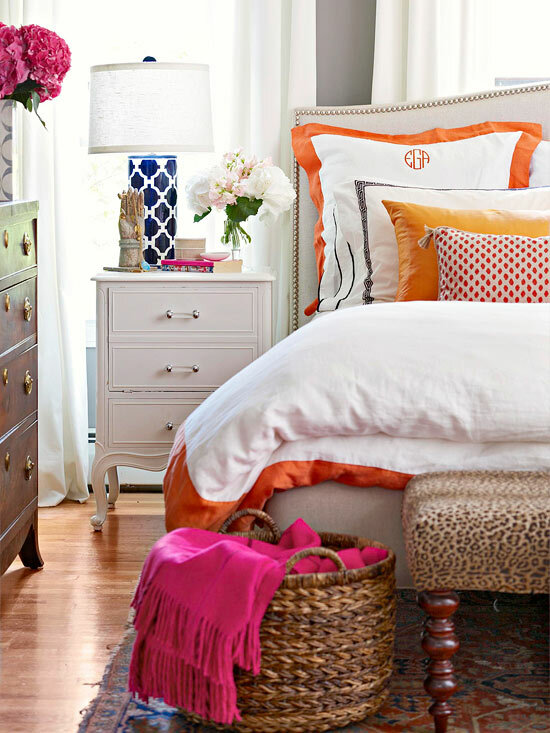 One of my favorite more brave colorful mix and match collected over time rooms is this bedroom from Sarah Richardson’s Farmhouse. You can’t get much more traditional than a dark wood four poster bed, but just look at the amazing colors and patterns that liven things up! 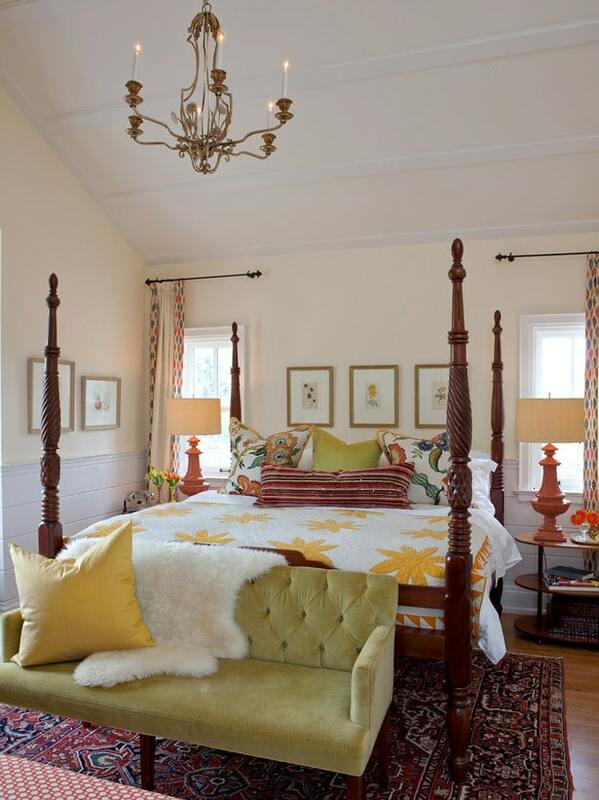 Note the other pieces in the room like that traditional rug mixed with fun colors in the patterned furniture, the orange lamps, yellow pillow or textures like the trendy fur throw that mix things up and give this room its modern yet traditional cottage farmhouse appeal! But even if you aren’t sure about that “nothing actually goes together” look, you can be more subtle and still mix things up. Let’s look at another example. 3. Pull your look together with repetition. So what if you are overwhelmed by your random furniture and accessories and you can’t figure out how to tie it all together? What’s the secret? One of the best ways to bring together various types of furniture, wood tones and styles is to decide on common color scheme or design element you can repeat throughout the space! Repetition is a way to pull a room together. This comfortable cottage room above features a more neutral palette, but it still has cottage style and mix and match charm. Look at the lovely collected over time pieces like the traditional wing back chair, bamboo and wicker furniture and eclectic mix of frames. The white slipcovered sofa and white upholstery pieces tie the room together visually, and keep the overall feel of the room neutral and calm. By repeating the white upholstery, the room feels more unified. Let’s go back and look at the other rooms above. Do you see any repeated elements that tie the eclectic pieces of each room together, even in a subtle way? A pair of matching lamps, a set of matching pillows, or a repetition of similar frames on the wall. An abundance of white that ties a room full of random color and pattern together. Furniture unified by repeating a common fabric pattern. 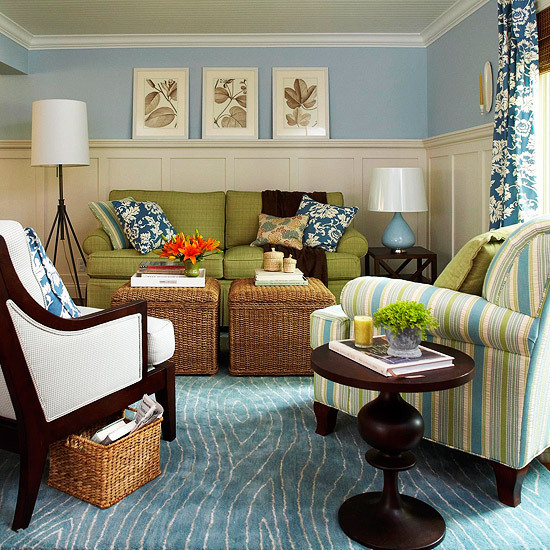 An accent color or palette of colors repeated in several places to draw your eye around the room. A collection of accessories united by a common material, such as the gold mirrors in the top photo. Mixing and matching traditional pieces to create a unique and fresh style is not only possible, but FUN! 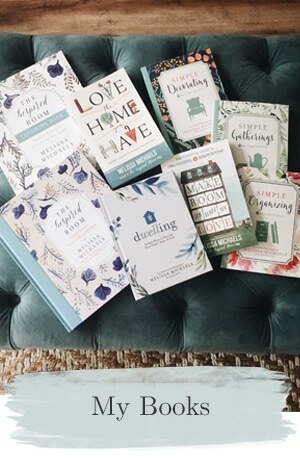 Check out my bestselling decorating and homemaking books for more inspiration! SO HELPFUL! Thank you for all the tips and gorgeous rooms today! I love that you showed how you can freshen up dark furniture without painting everything too, and the rooms looks FANTASTIC. I’m totally inspired now! Thank you for sharing these tips. This is just what I have been looking for. I have so much furniture I’ve inherited from my family. 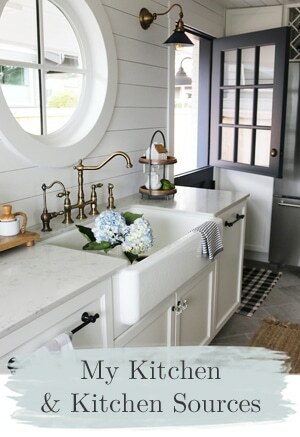 When I look at blogs it seems like everyone got rid of their old stuff and dark furniture bought everything new so I was thinking my house was out of style, but this gives me a new appreciation for how to incorporate all kinds of furniture and still find a way to have that airy cottage feel. I love it! Great tips! I love the mix and match look! Great tips and photos! I love mixing old with new, modern and traditional. Really great post, thanks! I know I’ll be referring back to it many times. LOVED this post, and thanks so much for linking to mine! I was raised as a matcher who is trying to break away and BE a mixer! I’m late 50’s (why do I feel the need to say that??) and hope it isn’t too late for me to learn. I started out with a matched style from Ethan Allen when we were first married. It pretty much all went be the wayside except for a few end tables and lamp. Along the way I acquired several pieces that were my parents’ that were quite old and rebelled at using them and then one day, after hearing someone compliment my style of decor, I decided that I just needed to have fun and work with it. Nobody else has what I have…so I guess it can become anything I want it to be. Sure, I’d love the money to play around with upholstery….but it works!!! And most of all…I’m having fun in ways I had never dreamed! Repetition. I think you just saved my life!! I’ll bookmarking this post for future use. What a great collection of inspiration! I love the wood tones and the not matchy styles. We’ve been married 13 years and have never been able to buy furnishings for a whole area all at one time. Others are correct, sometimes watching bloggers replace everything they have & change their entire space can be so frustrating! I adore these spaces that look so collected over time! They look comfortable, relaxing and so welcoming! Great post! Thanks! What a wonderful, useful post. This is great content, full of great examples and suggestions I will use for sure. Thanks so much! Thanks so much for the great tips and reminders! I love your tip to love what you already have! Sometimes we forget that it’s fun to repurpose things in our house that we already have! Move something to a different room, pull out a rug you have stores for a while or change up a focal point in the room, etc. and it always makes hubby happy when I am just using stuff we already have instead of buying new!! What beautiful rooms you chose to highlight. And great tips!! I, too have a lot of dark furniture but I love the way white lightens up a room and makes it feel more cottage like a beachy. You had some excellent tips and suggestions to get that look…can’t way to try some of them out! Thanks! Great post and beautiful rooms in the photos! Did you notice that all but one of your rooms had windows with white painted trim? Sometimes it is not always the furnishings, but the room itself that is a “style-stumper.” I would love to paint all my trim white, but that wouldn’t go over very well here, so we deal with the stained wood windows and doors. Repetition of color or fabric is such a lifesaver! Great advice! Yes, trim can be a stumper! Several rooms in my old house had wood trim, too. But I loved it and it worked well with our white walls! :-) Thanks Kelly! 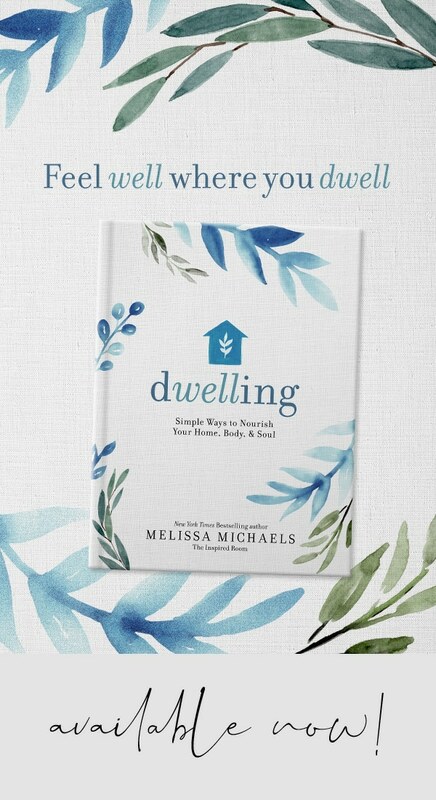 Good stuff, Melissa! You make this stuff seem doable and take some of the angst away. I firmly believe that if we surround ourselves with things we truly love, it will “go together” (as you said) even if it doesn’t match! This is such a great post on mixing things up!!! 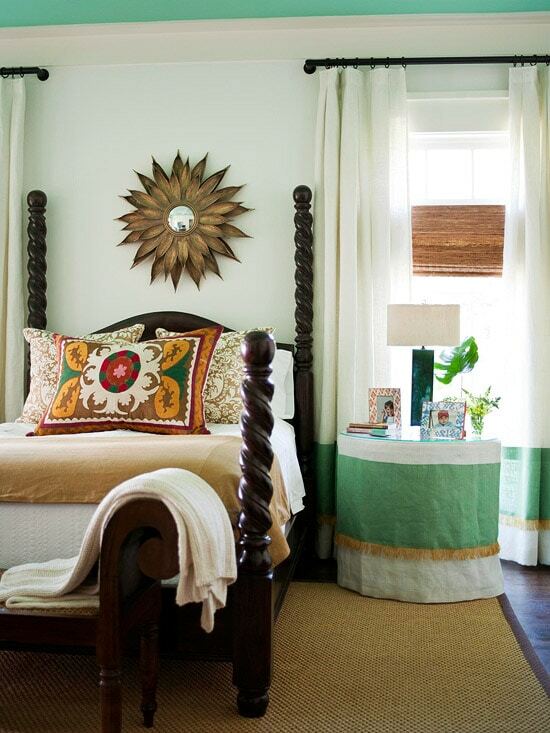 I am such a traditional girl at heart but love to add a punch of color and pattern to modernize a space!!!! Great photos too!!! BIG LOVE it!!! I agree this might just be THE HOUSE!!! Loved the entire interiors of the room, well organized in specific with the great furnishings and lovely wall textures and also antique furniture and love the stairs, the entire things looks greatly organized in a professional manner. Love this post…it is well written and has beautiful photos. Still relevant two years later. Such a helpful page! We have my old bedroom set I inherited from my mother that she had as a child, which has a four poster double bed. My daughter is old enough for a full size bed but has white furniture in her room, I wasn’t sure if we could mix the stained wood bed with her furniture, and I am so happy that the antique bed will get to be finally taken out of storage and used again! excellent examples, wish i could utilize all of them. This helps so much with the dark furniture pieces I love but don’t know how to use in a new vision for our home. Perfect. Omg, I just moved and I am definitely “challenged” when it comes to home decor. I live in traditional Lancaster county, and have so many pieces of furniture passed down to us or finds that I LOVE. I’ve painted some smaller pieces, but just couldn’t understand how to incorporate those pieces that made my room look dated without covering the beautiful wood with paint. This was amazingly helpful. Thank you so much! I love the white cabinet in the first picture? Can you remember where you got it or what that kind of cabinet is called? I have a Californian Bungalow house with beautiful walnut coloured doors, window frames, picture rails & skirting boards. In my bedroom I have a dark wooden bed and matching dark furniture. I now want to purchase a built-in wardrobe and I am really worried about having a dark wooden one. Although it will match what is there, I am really worried that it will make the small bedroom look too dark. I actually want a white wardrobe, but my concern is that it will clash with all the dark wood. My husband thinks that a white wardrobe will look completely out of place and he is usually good at visualizing things in advance (I like us to be in agreement). But this post has convinced me that possibly introducing some white may not be a bad idea. I also have a small dark bedside table that could be painted white. The large bed could stay walnut brown. I do not plan to re-paint walls or wooden structures.